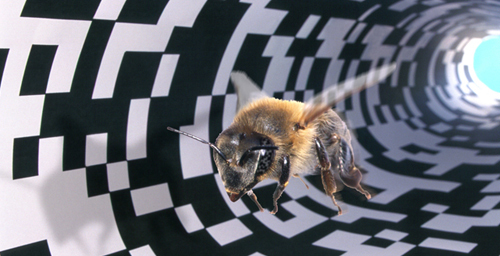 Researchers can trick a honey bee into thinking she has traveled a longer or shorter distance through a tunnel that leads to a food source by varying the pattern on the tunnel walls. A busy pattern, as seen here, is perceived as a longer distance than a sparse pattern. Photo provided by Jrgen Tautz from his book "The Buzz About Bees: Biology of a Super Organism." CHAMPAIGN, lll. - Tricking honey bees into thinking they have traveled long distance to find food alters gene expression in their brains, researchers report this month. Their study, in the journal Genes, Brain and Behavior, is the first to identify distance-responsive genes. The genome is not a static blueprint for life, as was once believed, said University of Illinois neuroscience and entomology professor Gene Robinson, who led the study. "Here is another piece of the world that the genome is responding to that we didn't know about before." Foraging honey bees make unique research animals in part because they communicate in a language humans can decode, said University of Illinois entomology and neuroscience professor Gene Robinson, who led the study. After a successful hunt, a forager performs a highly stylized "dance" that tells her peers what direction to go to find the food, how good it is and how far away it is. The bee does a "round dance" if the food is close to home, while a "waggle dance" indicates it is farther away. The new study used an established method for altering a honey bee's perception of distance as she flew through a tunnel to gather food. Vertical stripes or a busy pattern on the tunnel walls can trick a bee into thinking she is traveling a greater distance, while horizontal stripes or a sparse pattern indicate a shorter distance - even though the tunnels are the exact same length. At the end of the flight, a researcher watches the honey bee dance to find out how far she thinks she flew. "This is a great example of what you can learn if you are able to manipulate an animal to be able to tell you what it's thinking," Robinson said. Some bees (labeled SS bees) traveled the "short" distance repeatedly to get to the food, while others (the SL bees) trained on the "short" distance and then were switched to the "long" distance tunnel. Brain gene expression differed between the groups. A total of 29 annotated genes (for which sequence, location in the genome and function are known) were "differentially regulated between the SL and SS bees, either in the optic lobes, mushroom bodies, or both," the researchers wrote. 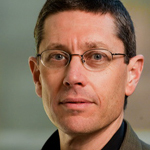 Surprisingly, the patterns of gene expression (which genes were turned up, down, on or off in response to the experience) were similar in both brain regions, Robinson said, suggesting that similar molecular pathways are involved in responding to distance information in different parts of the brain. The fact that gene activity changes in the mushroom bodies may indicate that some of the information is encoded in memory, he said, "which makes sense because bees need to remember their flight distance long enough to communicate it to hive-mates by dance language." This study adds a new dimension to the ongoing exploration of the socially responsive genome, Robinson said. The genome is not a static blueprint for life, as was once believed, he said. "Instead we see how responsive the genome is to environmental stimuli and especially socially relevant stimuli. Here is another piece of the world that the genome is responding to that we didn't know about before." Editor's note: Gene Robinson directs the Neuroscience Program and is a theme leader at theInstitute for Genomic Biology at Illinois. To contact Robinson, call 217-265-0309; e-mailgenerobi@illinois.edu. The paper, "Distance-responsive genes found in dancing honey bees," is available online.